Danny Isaacs Band is a 4-piece rock band tearing up Indianapolis, Indiana. It all started back in 1994 when Danny met Gregg at a pizza shop they were working at. They knew they were both in bands at the time, and wanted to check out the others band. Gregg came out to see Danny's band and saw that they needed a real guitar player. After they hooked up, that band kind of fell apart. Enter Ray. Ray and Danny knew each other from the "scene" at the time. They started playing out all over and went on for what seemed like forever. That band kind of fell apart. So, in the down time Danny started playing out as a solo acoustic act. All the while, hitting the studio and recording demos. Gregg and Ray also had other bands during the down time. In 2001the first Midwest Music Summit was coming up so Danny submitted to play. He was asked to do an acoustic show at the hosting hotel. He didn't want to do it alone so he had Gregg sit in on the set. It went great; Ray and his current bass player came out to see the show. They all had some drinks and the Danny Isaacs Band was born! Since then the band has been on a roller coaster ride that wont stop. 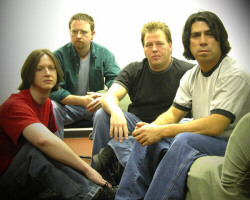 They have played every Midwest Music Summit; 2001, 2002, 2003, 2004 and 2005. They have opened for National acts, played at the biggest venues in Indy, played at the Indiana State Fair twice and traveled a little out of state. Had some exposure on local Radio and TV. They have sold out of both 5 song demos they put out in the last year. The band creates quite a buzz everywhere they play. The band plays at all the hippest clubs in town and is looking forward to covering more ground than ever before. It's all about taking the music to the people, so this year it's about getting out there and seeing what the people think about D.I.B!